I found this story recently and thought it bore posting. It's a heartwarming tale that reinforces why we love our canine companions so much. This story is so much more touching because not only was the hero from a shelter, but so was the rescued dog until recently. Nala is also an older dog. Mature dogs are difficult to place but are every bit as deserving of a caring family. Hopefully this compassionate animal was able to find a loving home. 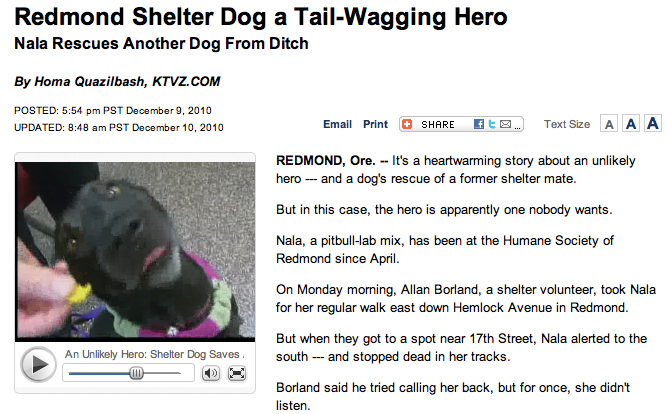 REDMOND, Ore. -- It's a heartwarming story about an unlikely hero --- and a dog's rescue of a former shelter mate. But in this case, the hero is apparently one nobody wants. Nala, a pitbull-lab mix, has been at the Humane Society of Redmond since April. On Monday morning, Allan Borland, a shelter volunteer, took Nala for her regular walk east down Hemlock Avenue in Redmond. But when they got to a spot near 17th Street, Nala alerted to the south --- and stopped dead in her tracks. Borland said he tried calling her back, but for once, she didn't listen. "Usually, she comes back to me when I call her, or give her a little tug on her collar," Borland said. "This time, she wouldn't. She kept pulling me, so I just let her pull me." Borland said Nala then pulled him into a nearby ditch, about 200 yards down. And that's when he saw the little dog. "It was very filthy -- at first I thought it was dead," Borland said. "Then I took a second look and saw it was breathing." Borland headed back to the shelter and alerted a staff member, and the two went back to rescue dog. "It came around right away, it only took a few seconds and it was able to stand on its own feet," Borland said. "That's when I noticed it had ice balls frozen to all its feet." 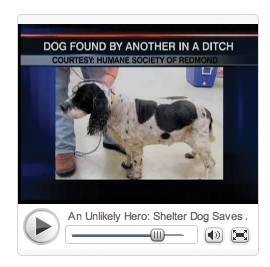 The rescued dog is a 10-year-old cocker spaniel named Chadwick, adopted out of the Humane Society of Redmond just recently. Shelter officials said they don't know if the two dogs knew each other during their time there, but it's likely Nala alerted to the scent of another dog nearby. Chadwick, who's also blind, had escaped from his owner's property --- and was missing for a week before Nala's heroic discovery. "Nala is a big hero --- she deserves all this credit. I would have never looked into that ditch if it hadn't been for her dragging me to it," Borland said. But despite her heroism and sweet nature, shelter Manager Chris Bauersfeld said Nala has three strikes against her --- which contribute to her shelter stay of nearly eight months. "She's a pit bull mix, she's black, and she is a little bit older, between five and seven years of age," Bauersfeld said. Bauersfeld said that's because people typically bypass black dogs and pitbull mixes --- and most want a dog that's younger. "Because they don't want to anticipate the inevitable end coming as quickly as it does," Bauersfeld said. But Bauersfeld said Nala is a delightful dog, and shelter officials are looking to find the hero a happy home. Nala is available for adoption, as are many other animals, at the Humane Society of Redmond on 1355 NE Hemlock Ave.